Stay organized with teacher nameplates for the classroom. Up and Away nameplates are a simple solution for labeling desks, cubbies, lockers, and more. 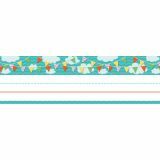 The pack includes 36 nameplates—each measuring 9.5" x 2.875" and featuring patterned banners across a bright sky. Organization is essential to a productive learning environment. From desk nameplates for students to classroom management sets for you, Carson-Dellosa provides a variety of products to help you stay organized. Create the classroom of your dreams by checking out other Up and Away products. Whether in the classroom or on a field trip, Up and Away name tags provide a fun and easy way to organize. The pack includes 40 self-adhesive name tags—each featuring a bold banner design and measuring 3" x 2.5". Make sure everything stays in order with Carson-Dellosa's stylish name tags. Available in a variety of colors and themes, the self-adhesive name tags are perfect to label storage boxes, folders, cubbies, and shelves. 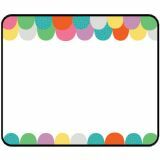 Create a cheerful classroom by checking out coordinating Up and Away products. Create a positive learning environment with motivational classroom décor. 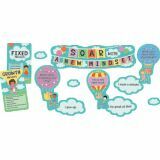 Teach your students the importance of a growth mindset with this 27-piece set. Carson-Dellosa's mini bulletin board sets add visual interest to small areas such as doors, centers, and windows. Use pieces together or individually to create decorative, motivational, or classroom management displays. Make sure to view coordinating Up and Away products to create a cohesive classroom theme. Our Yellow Brick scalloped borders will add a whimsical touch to classroom displays, message boards, bulletin board sets, and more. Add a little bit of magic to classroom displays with our enchanting Yellow Brick scalloped borders! These bright borders feature a yellow brick pattern with pops of teal and red. 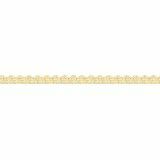 This border pack includes 13 strips—each measuring 3' x 2.25” for a total length of 39'.